Looks like Apple is all about no discounts to any one! Financial Times App will no longer be available in the app store after being pulled out by Apple over a disagreement over how Apple would collect payments from the newspaper. Apple wanted to treat all in-app purchases; whether that be new weapons on a game, extra tracks for a music app or, in the FT and other publications’ cases, subscription fees, in the same way. Apple wanted to charge a 30 per cent cut. 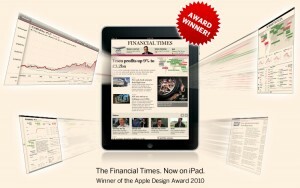 The Financial Times has almost 250,000 digital subscribers and, back in June, launched its own web-app in preparation for the move out of the App Store which it claims has been used by 550,000 people during its free trial period. This might be the beginning of where Financial Times might switch to other providers inadvertently forcing consumers to buy other tablets rather than an iPad. Apple Making Huge Changes to its Store! Salted Hard Drives can Store Six Times More! How about a $7 Million Apple Glass Store?